Early week snowstorms at major airports (like Frankfurt and Atlanta) continue to play havoc, while peak air season may extend into February. Rates have been stabilizing, but by the time pre-Christmas backlogs are cleared, the Chinese New Year surge will kick in. Companies with annual carrier tenders have made up for having above-market rates earlier this year. However, those depending on the spot market have seen standard peak rates nearly triple. Beyond bad weather and peak season, there are several other contributing factors for the air freight increase, including brisker world trade, burgeoning cross-border e-commerce, and air freight growth for several non-retail sectors. Despite peak season surges in demand, and growing demand throughout 2017, ocean freight rates have declined throughout the year. This week, transpacific rates slid back as December 1 GRIs lost traction. Some carriers have persevered with mid-month GRIs. We expect these, as well as the January 1 GRIs, to be modest and fleeting. China-US West Coast rates dropped slightly (-1%), and are still well behind (-29%) last year’s rates. China-US East Coast rates also dropped (-6%), and are still well behind (-30%) last year’s rates. 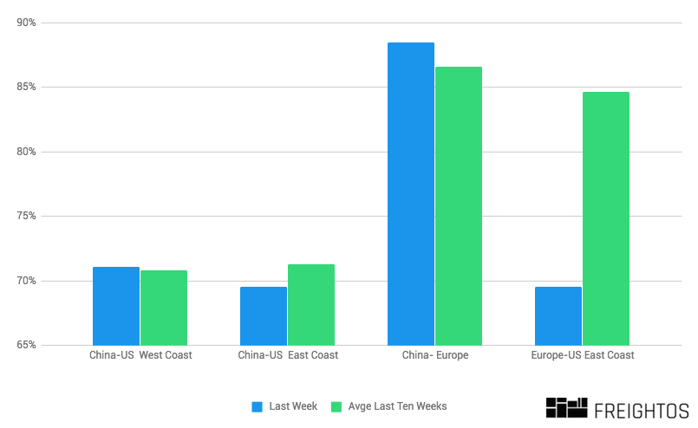 This week’s 9% rise sees China-Europe rates continue to catch up on last year’s rates – from being 25% behind four weeks ago to only being 12% behind last week. Europe-US East Coast rates rose modestly, stemming a four-week drop, but stayed a full 30% lower than last year’s rates and slightly less than half this year’s high ($3,549 in W5 and W6). Unlike other freight indexes, the Freightos International Freight Index (FIFI) uses aggregated and anonymized real-time business data from global carriers, forwarders and shippers on the Freightos AcceleRate freight rate management platform. That’s why we believe these indexes to be the most accurate and real-time representation of market rates available. What’s more, it’s offered for free. Access freight rate insights from 500+ million price points. For free.